1. FAP 환자가 total colectomy를 거부한다면? 2016년 1월호 Endoscopy지에 일본 연구자들이 total colectomy를 거부한 환자의 내시경 치료에 대한 놀라운 논문을 발표했습니다 (Ishikawa H. Endoscopy 2016). 세 센터의 환자를 모은 후향적 연구였는데 inclusion criteria는 다음과 같았습니다. Included patients were adults with FAP who had > 100 colorectal adenomas and/or a germline mutation in the APC gene, detected primarily by the Protein Truncation Test, and who strongly refused to undergo colectomy and were managed instead by endoscopic polyp clearance. The following patients were excluded: 1) patients with CRC, 2) those with large adenomas not amenable to endoscopic removal, 3) those with dense polyposis, or 4) patients who refused further endoscopic removal. Figure 1. Endoscopic images. a Before polypectomy. b After polypectomy. 평균 29세에 찾아온 환자 95명을 5.1년 경과관찰하면서 환자 당 8회의 대장내시경을 통하여 55,701개의 용종을 제거하였습니다. 환자 당 475개의 용종(내시경 검사 당 73개)을 제거한 셈입니다. 1,000개 이상의 용종을 제거한 환자도 16명이나 되었습니다. 이 많은 용종을 제거했는데 출혈이나 천공은 하나도 없었다고 합니다. 더욱 놀랍습니다. Results: Of the 95 eligible patients, five (5.3 %) were excluded. The remaining 90 patients (median age at first visit 29 years [range 16-68 years]; 46 males) were followed for a median of 5.1 years (interquartile range [IQR] 3.3-7.3 years). During this period, a total of 55,701 polyps were resected without adverse events such as bleeding or perforation. The median numbers of endoscopic treatment sessions and polyps removed per patient were 8 (IQR 6-11) and 475 (IQR 211-945), respectively. Five patients had noninvasive carcinoma (Category 4.2 according to the revised Vienna classification), detected within 10 months from the start of the follow-up period. All of these patients were treated endoscopically, without signs of recurrence during a median follow-up of 4.3 years (IQR 2.0-7.1 years). No invasive colorectal cancer was recorded during the study period. Two patients (2.2%) underwent colectomy because the polyposis phenotype had changed to dense polyposis. Conclusion: Endoscopic management of FAP is feasible and safe in the medium term. 물론 용종이 너무 많았던 FAP 환자의 경우("dense polyposis")는 처음부터 제외되었습니다. 아무리 그렇더라도 한 환자당 거의 500개의 용종을 제거한다는 것은 저로서는 도저히 상상할 수 없는 일입니다. 저자들은 "medium term"에서는 별 문제가 없는 것 같다고 하였지만 long term 결과를 꼭 살펴봐야 할 연구라고 생각됩니다. Figure 3. Endoscopic appearance of dense polyposis. a With indigo carmine dye application. b Without indigo carmine dye application. The entire surface of the mucosa is covered with innumerable flat adenomas. 이번 일본 연구 다음에 Spain의 연구가 실렸습니다 (Valentin F. Endoscopy 2016). 일부 FAP가 포함되었는지는 모르겠으나 10-100개 정도의 대장 용종이 있었던 265명에 대한 후향적 연구였는데 제법 많은 사람들이 암이 되거나 수술을 받았습니다. Patients underwent a median of 5 colonoscopies, and 17 patients (6.4 %) were diagnosed with CRC. A total of 32 patients (12.1 %) underwent surgery, including 15 (5.7 %) for prophylaxis without a diagnosis of CRC. 일본 연구와 스페인 연구를 종합하여 미국의 Andrew Kaz (제가 2007년 미국 Seattle 연수 시절에 같은 실험실에서 함께 일했던 동료였습니다)가 editorial을 썼습니다. 비록 일본에서 좋은 결과를 보여주었지만 아직 수술을 하라는 가이드라인(AGC guideline 2015)을 바꿀 때는 아니다고 쓰고 있습니다. While these studies do offer some reassurance about the feasibility of endoscopic management of patients with colon polyposis, the intensive procedural demands of the Japanese study, the relatively high cancer risk seen in the Spanish study, and the modest duration of follow-up should make us cautious about revising any current treatment guidelines. So what counsel should we provide to our patients with colon polyposis? First, based on our cumulative knowledge about colon polyposis syndromes, we should continue to stress that colectomy remains the treatment of choice for FAP or in any case of polyposis where endoscopic clearance of colon polyps is no longer achievable, as per current guidelines. Second, chemoprevention with nonsteroidal anti-inflammatory drugs such as aspirin, sulindac, or celecoxib has been shown to reduce the colorectal polyp burden in polyposis syndromes, although their effect on preventing cancer in these patients is less clear. Clinicians should emphasize that these medications are no substitute for colectomy, but they may make the strategy of colonoscopy and polypectomy more successful by reducing polyp size and/or number. ?For those who decline colectomy or for whom colectomy is not yet indicated, it appears that carefully selected cases can be managed with polypectomy in the short term. We agree with Ishikawa et al. and others that high risk patients who defer colectomy should be managed by expert endoscopists with the capacity to offer chromoendoscopy, endoscopic mucosal resection, and other advanced resection techniques in a setting that allows for lengthy procedures . Although the optimal colonoscopy surveillance interval for patients with FAP and other polyposis syndromes who decline colectomy has yet to be determined, it is important for clinicians to educate this patient population about their cancer risk as precisely as possible and to ensure that they understand the limited evidence regarding long term outcomes of endoscopic treatment. 2016년 1월호 Endoscopy 지에 Do's and don'ts in evaluation of endoscopic screening for gastrointestinal cancers라는 제목의 흥미로운 리뷰가 실렸습니다(Bretthauer M. Endoscopy 2016). 암검진에는 lead time bias와 length time bias가 문제라는 것은 다들 들으셨을 것입니다. 검진에서는 천천히 자라는 암이 진단되고 빨리 자라는 암은 검진으로 진단되지 않을 수 있다는 length time bias를 설명하는것은 쉬운 일이 아니었습니다. 이번 리뷰의 그림은 length time bias을 참 알기 쉽게 보여주고 있습니다. (과장하여 말하면) 꼭 필요한 병은 발견되지 않고 별로 발견하지 않아도 좋을 병만 왕창 발견되는 것이 검진일 수 있습니다. 검진 프로그램을 기획하고 검진의 효과를 홍보할 때 이 점을 간과하지 말아야 합니다. Survival and lead-time bias in cancer screening. No-screening (upper time line) and screening (lower time line) in identical tumor growth scenarios are compared. In the example shown, there is no net effect of screening (time points of death are similar for screening and no-screening scenarios). The time of start of tumor growth, clinical detection, screening detection, and death are marked on the two timelines. The solid green line illustrates the time without a cancer diagnosis, the dotted green line illustrates the lead time (the individual is living with a cancer diagnosis after screening), and the dotted black line illustrates the time from the clinical diagnosis until death. 2016년 1월호 Endoscopy 지에 일본 연구자들이 위암 확대내시경에 대한 상세한 논문을 발표하였습니다 (Shibagaki K. Endoscopy 2016). WLE (white light endoscopy), NBIME (magnification endoscopy with narrow-band imaging), A-NMIME (NBIME with acetic acid enhancement)를 이용하여 macroscopic pattern에 따라 M1/M2/M3, capillary pattern에 따라 C1/C2/C3/C4, surface pattern에 따라 S1/S2/S3으로 나누었고 각각 adenoma/differentiated type EGC/undifferentiated type EGC로 간주하였습니다. 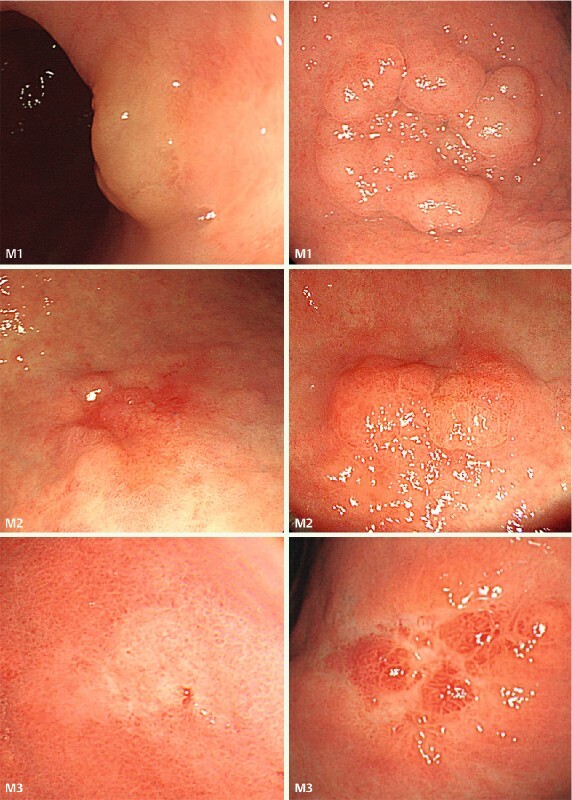 White-light endoscopy (WLE) images illustrating the macroscopic pattern classification of gastric mucosal neoplasms. Type M1, suggestive of adenoma, is a protruding or flat elevated whitish lesion with a roundish edge and a smooth or often nodular surface. Type M2, suggestive of differentiated adenocarcinoma, is an irregularly shaped and depressed, flat, or elevated lesion either with a red color or without discoloration. Type M3, suggestive of undifferentiated adenocarcinoma, is a depressed whitish lesion with or without variously sized reddish nodules. 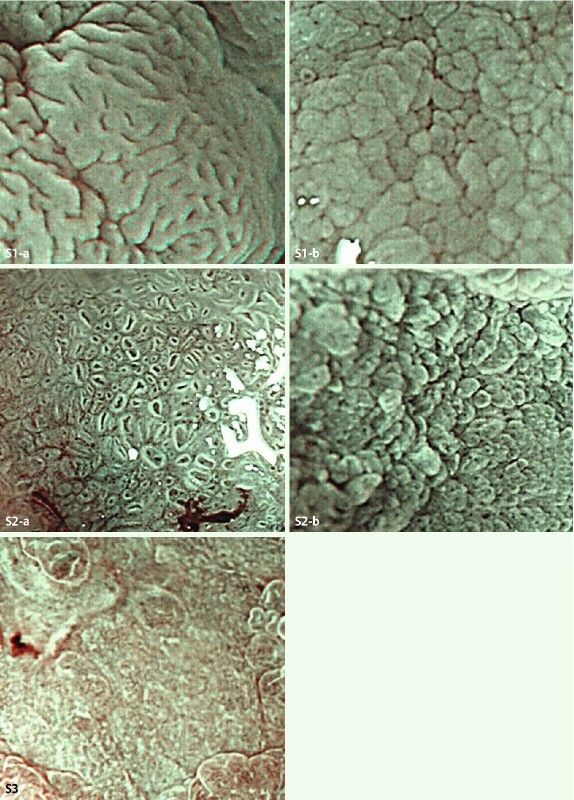 Magnification endoscopy with narrow-band imaging (NBIME) images illustrating the capillary pattern classification of gastric mucosal neoplasms. Type C1, suggestive of adenoma, has capillaries with a homogenous diameter and distribution, which form round or oval networks (C1-a, network form) or grow within regular mucosal microstructures (C1-b, intra-microstructure form). Type C2, suggestive of differentiated adenocarcinoma, has capillaries with a heterogeneous diameter and distribution, which form a polygonal or incomplete network (C2-a, network form) or grow within irregular mucosal microstructures (C2-b, intra-microstructure form). Type C3, suggestive of undifferentiated adenocarcinoma, has capillaries with a heterogeneous diameter and distribution, which grow in a disordered fashion with an unclear mucosal microstructure. Type C4, which is not related to a specific histologic type, has capillaries that are invisible or obviously decreased in number. 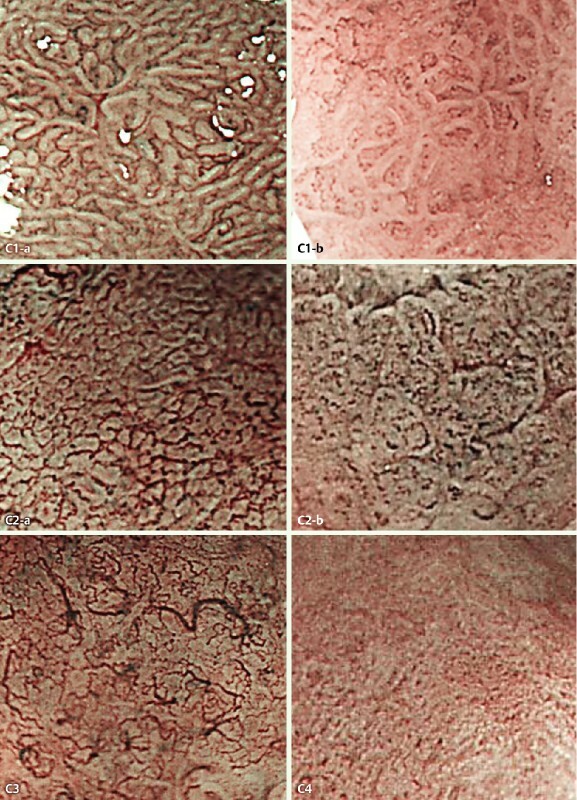 Magnification endoscopy with narrow-band imaging and acetic acid enhancement (A-NBIME) images illustrating the microstructure pattern classification of gastric mucosal neoplasms. Type S1, suggestive of adenoma, has glandular crypts present, with homogeneously sized, shaped and arranged foveolae (S1-a, foveola form) or grooves (S1-b, groove form). Type S2, suggestive of differentiated adenocarcinoma, has glandular crypts present, with heterogeneous foveolae or grooves (S2-a, foveola form; S2-b, groove form). Type S3, suggestive of undifferentiated adenocarcinoma, has absent or severely decreased numbers of glandular crypts. 저자들은 아래 Table 5 결과를 바탕으로 "A-NBIME showed statistically significantly higher diagnostic accuracy for gastric mucosal neoplasms, with good reproducibility, compared with WLE and NBIME, which provided similar lower accuracy. "라고 결론짓고 있습니다. 어떻게 해석되어야 할지 고민입니다. Acetic acid를 사용한 확대내시경이 도움이 된다는 것은 인정할 수 밖에 없을 것 같습니다. 하지만 white light endoscopy와 NBI 확대내시경의 차이가 없다는 이번 결과는 기존에 많은 일본 연구자들이 NBI 확대내시경이 진단에 유용하다고 주장했던 것과는 상반되는 것입니다. 저는 이번 연구 결과를 'white light endoscopy도 잘 보면 상당히 좋다'는 방향으로 해석하고 싶습니다. 향후 어떤 방향으로 결론이 모일지 지켜볼 일입니다.